I don’t know about you, but I really like the color scheme of black with a red interior. I know that black is one of the less common colors on Corvettes, so out of curiosity, I looked up the production stats. Out of a total of 10,261 Corvette produced in the 1961 model year, 1,340 of them were black. Having said that, I don’t know that this car was originally black. Determining the original color isn’t as simple as checking the code on the trim tag. 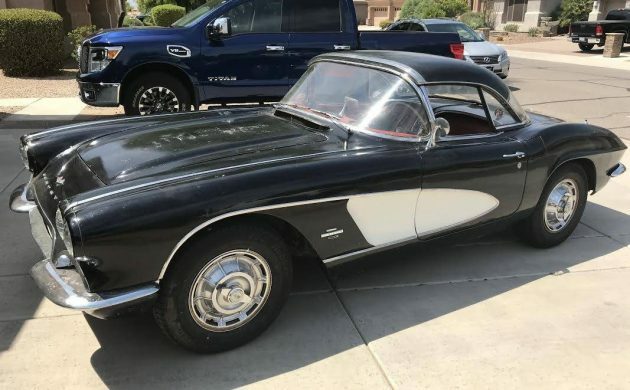 Corvettes didn’t have trim tags until 1963. 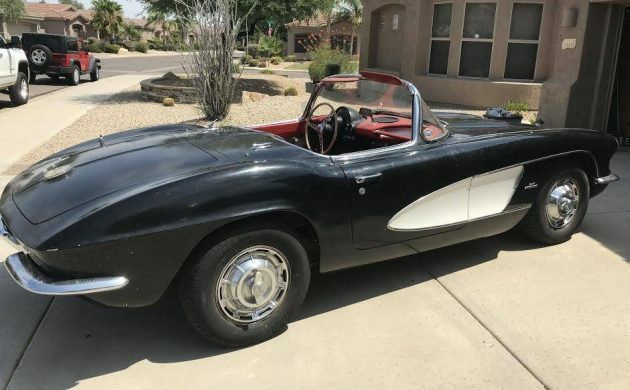 Located near Phoenix, AZ, this (currently black) 1961 Corvette is listed here on Craigslist for $40,000. 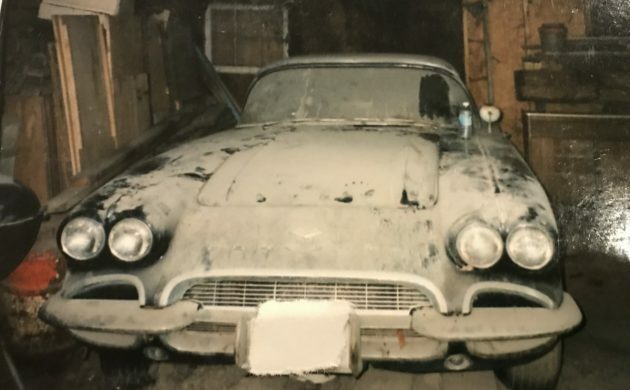 I learned something else while researching, the coves were painted silver on the black cars. The cove paint extended all the way to the wheel opening, too. This one has had a little personalization. Nothing wrong with that. It’s just paint. Many Corvettes were “personalized” a lot worse than this in the 1960’s and 70’s. I recall telling someone one time that I’d never seen a customized Corvette that I liked. I mean just look at this. What modification could be done that would be an improvement? The seller didn’t post any engine compartment pictures, so we’ll just get by with another side view. The engine is reported to be a 283. The transmission is a Powerglide. Some recommissioning work has been done since the car came out of storage. The brakes have been rebuilt including new shoes, drums, and brake lines. The fuel lines, water pump, and tires are new too. The seller says the car runs and drives. It comes with both the convertible top and a hard top. The odometer reading is 95,000. The interior looks like it’s in good serviceable condition just like it is. Being from Arizona, I wouldn’t expect frame rust to be an issue. I’d certainly want to have a look for myself though. It could have spent some time in the north at some point. 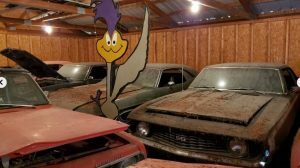 If anyone is in the market for a cute little C-1 to drive or restore, here’s one that looks like a very good candidate. Someone is bound to say it’s priced too high, but the ad doesn’t say the price is firm. What are your thoughts on this ’61? Nice rig. Sounds fair if it is in decent shape. Pretty car. Please tell me once again why the 2 differant styles of text in your story? Confused? Thanks, Mike. And if you can get my new comments via email to work you will be King!!!!! Thanks. if it’s a powerglide, then why is it showing a stickshift in the pic? I thought so as well, but I see letters on the right and no clutch pedal…pictures could be more clear, for sure. The shifter is correct for a Powerglide. Because Corvette’s didn’t have push button gear selection. Being sold with a second rolling chassis wouldn’t leave me that optimistic about frame condition. still like ’56 – ’60 (‘Italian style’ trunk area) best – w/the later yrs (due to ‘nicer grill’) in that group. Dangerous Q. One for every reader? Thnx for the find/post/pic/write up, Bobby. Whenever I see these I remember tge 60s Tv show Route66 starring Martin Milner and George Maharis ! I am Not sports car fan but for sure a Route66 show fan ! Oh No, Mr. Bill—a powerglide! That is unfortunate. 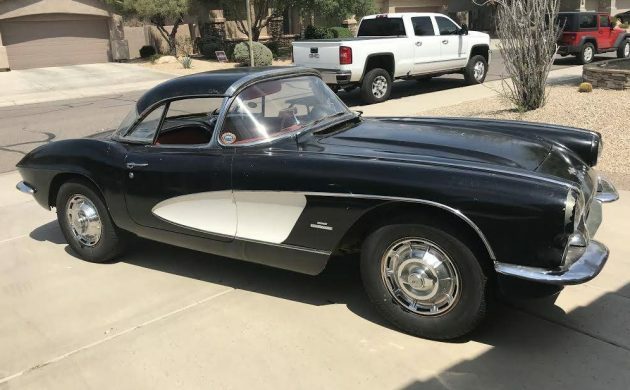 I like the older Corvettes,but this one looks kind of mundane–doesn’t catch the eye. Maybe just a good detail: wash/wax spiff up upholstery (re-dye leather?) Red is the only reasonable color for this vintage Corvettes. Bright white will also do. Dropping in a 4 speed would probably kill the value, but would be more fun. U could always box up the power glide in a large peanut butter jar in the event a future buyer wanted numbers matching. I always thought these and the 62s were an odd combination of the basic 1958 front and the soon to come 1963 tail. Nice though. I am going to have to question the statement that the cove went to the wheel opening. Show me an example, this car is not modified except for white paint. The cove color, if painted differently than the main body color, always continued on to the front wheel opening. Used to restore these for a living. Different times. Our airport manager had a son with a ’61, and borrowed it once. He and his wife bought a solid black/red ’62 with a 327/ four speed later that week. They took a summer “see the USA” trip shortly after, covering over 300 miles each day. He also brought back a few commemorative tickets back as well. And a stack of Mobil credit card receipts. Mobil products only for that family. No small feat since they were both in their late 50s. Though it is true that 53-62’s didn’t come with a trim tag, it’s still often possible to identify the original color. The original color can usually be found written on the bulkhead between the seats and the trunk, with a grease pencil. Yes, the coves are painted incorrectly. The factory always painted the entire area inside the moldings, never just the recessed area of the cove, and black cars came with silver coves, not white ones. Silver and white (silver and beige for 56-57) were the only colors the coves were ever offered in, and cove color was determined by the exterior color. Black, white and some blues, got silver coves, all other exterior colors got white (or beige) coves. I have to wonder if the interior was originally red, since all the hard parts (gauge cluster, center stack, heater cover, radio speaker & defroster bezels) are painted black. They should be painted red, in a red interior. The seats are not in the original pattern and the carpet isn’t the original “Salt & Pepper” material, so they’ve been replaced, and probably the rest of the interior. The car looks fairly decent, though the inclusion of a spare frame is a little worriesome. Just because a car is in Arizona now, doesn’t mean it didn’t spend it’s first 10 or 20 years in Michigan or Maine. The Powerglide is a little bit of a downer too, but not the deal breaker it once was. I’d say mid $30’s would be a little more realistic, especially for a Powerglide car with an unknown engine (at this point), but it does look like a good starting point for some lucky buyer. P.S. I also agree with your price assessment. As a raving Corvette fan, this car scores high on my “Meh” scale. 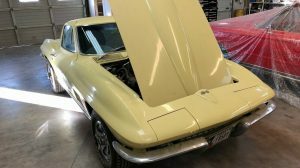 Not too much here to get excited about..
To think I sold my 61 Vette for $1,200 cry cry but that was in 1970. Strike that first sentence – what I was trying to say was $1200 in 1970 was worth around $7800 in in today’s dollars. Still not a total giveaway then. Anyhow, guess I need more coffee before I try to do any math . . .
Didn’t the ‘61’s have water pump troubles, due to design? DAMN IT! I live in Phoenix, now I have to take time out of my busy schedule and go look at a car. I don’t think anyone else has mentioned it, but WTF !! Only four pictures in an ad for a $40k classic Corvette ?!! The black paint is pretty rough on it, so that part could be original. 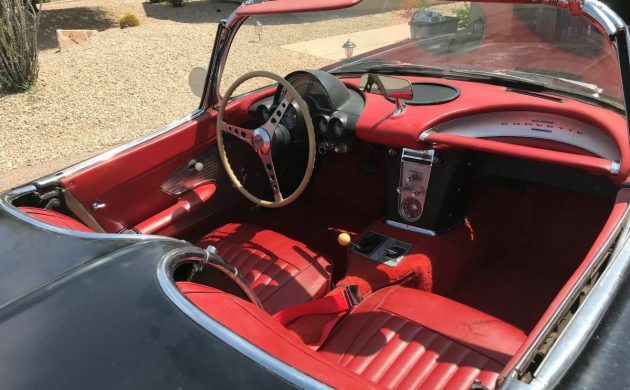 I agree with gbvette62, the interior looks to have been replaced at some point, and the coves have been redone incorrectly. And no pictures of the engine? That’s crazy. I have absolutely no problem with the 283/Powerglide combo, makes for a great cruiser. But that price is too high given the obvious work it’ll need, not to mention the hidden stuff. The rolling chassis is a bit worrisome. I’d definitely get a thorough professional inspection before pulling the trigger. Relax. It’s not a $40,000 car. restored a 62, crawl up under the dash. lot of over spray. its easy to find the original color. And as for the PowerGlide, as my mechanic said when I had to buy 2 new tires for my old Dodge Caravan, and there were no longer any that “matched” the two that still had good tread, “You going to be racing it much? If not, as long as the two on the front match each other, and the rear likewise, you are good to go.” Yes, there still places where “amateurs” can race cars like this, but not many anymore. And the races tend not to be “all out”, but granted, the PowerGlide would not be an asset in a race on a road course. Ok you guys shamed me into posting more pic’s. 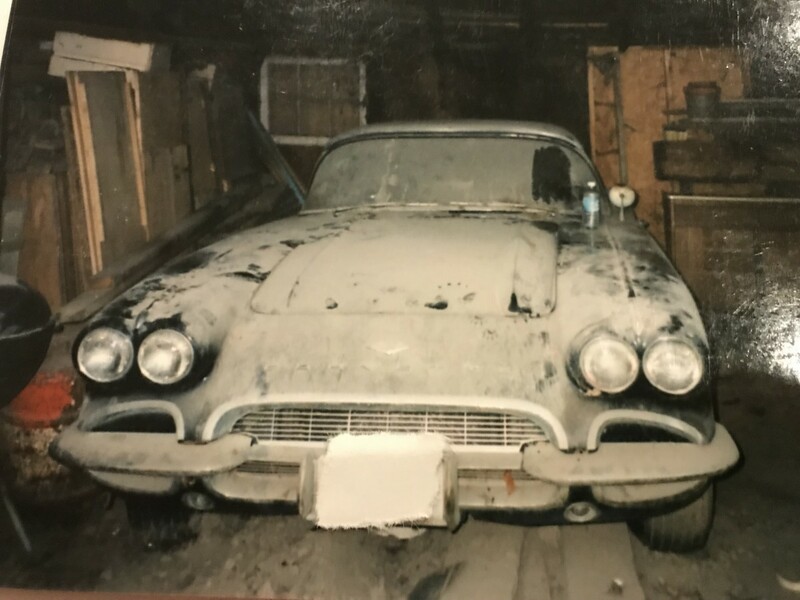 This 61 was in a barn for 26 years. I bought it and woke it up 2 months ago. I had no idea what kind of shape the engine or trans. was in. I had a ball, I was surprised at every turn, did nothing to the carb. This will make someone a great car.